The products on display provided potential investors and current stakeholders with information on the state of the industry, as well as an idea of what could be its future -- from cannabis-infused personal lubricants to hemp sprays for pets. Samimi said there's a huge market in the wings for consumer products, including cosmetics, edibles and beverages, and health products. "The current problem is supply, not demand," he said, noting that the consumer base is widening not only in North America but also Europe, South America and elsewhere. He said he's feeling positive about the process that is underway and believes the legalization door will open to more products in time. "Today I can go buy a joint and smoke it on the street, but I can't use a hemp-based pain cream, because it's topical, and that's not available yet," he said in an interview near Isodiol's booth, which featured empty packages for the company's products, which aren't yet licensed by Health Canada. "In a province like B.C. -- and particularly the city of Vancouver -- before legalization, there was a local ecosystem where everybody understood what was accepted practices," he said. "There was an understanding of what you could or couldn't do locally, and now it complicates the fact because there's a new regulated system" that doesn't always make its criteria clear, he said. The products on display at the cannabis expo ranged from smoke filters and odour-eliminating sprays to edibles and health and wellness products -- many of which aren't yet for sale or even licensed by Health Canada. Catherine Lefebvre, who represents a company that sells hemp-infused products, said she believed legalization would open the door for new business opportunities -- even for companies that already operate legally. She said people don't always understand that the products don't contain any THC -- the main psychoactive ingredient in cannabis -- and she's hoping more public events will provide opportunities for further education now that the industry is entering the spotlight. "We're there to teach people what it is, but we're there to open people's minds and show them that with the cannabis plant, we can do a lot of things." 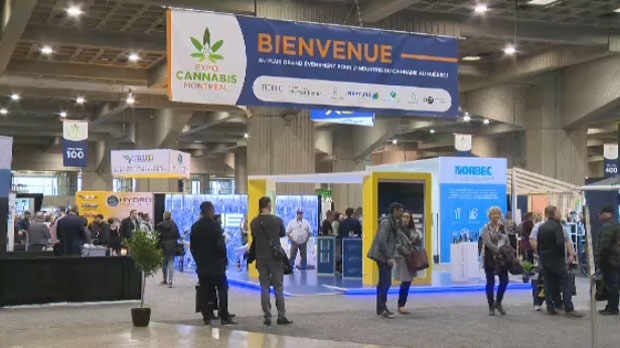 A variety of products were on display at Place Bonaventure during the Cannabis Expo trade show on Sat., Oct. 27, 2018.